Anticipation of ripe pears and apples peaks in fall as fruits hang heavily from branches and begin their gravity-aided trip to the ground. But how do you know when it’s prime picking time? According to Steve Castagnoli, a horticulturist with Oregon State University’s Extension Service, the signs are different for apples and pears. Still, there are signs. 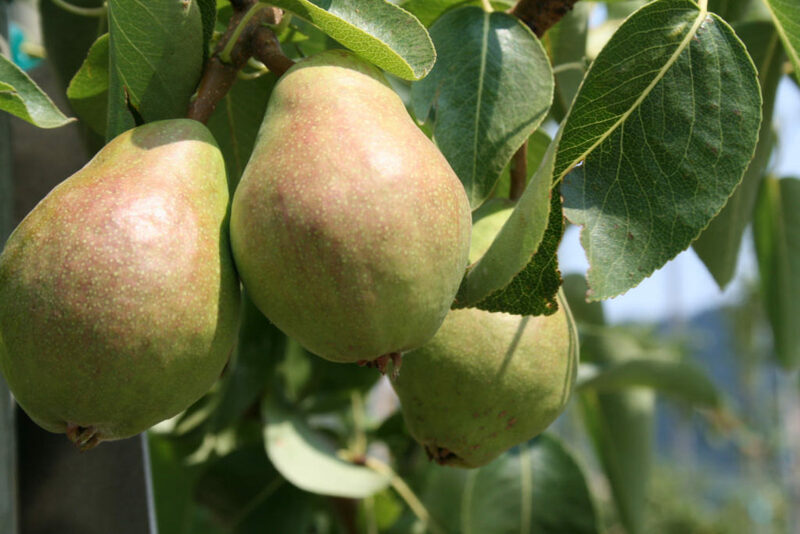 A mature pear will snap briskly and cleanly when tilted 90 degrees, according to Castagnoli. With the most commonly grown varieties such as Comice, Bosc and D’Anjou, the fruit will typically change from green to a slightly paler color. The flesh will get lighter and have some juice on the surface when cut. You can also go by maturity dates, which are included in OSU Extension’s publication Picking and Storing Apples and Pears. However, dates can vary. Except for being a little smaller than perfectly ready-to-pick pears, there’s no harm in taking them off the tree a few days too early, he said. The essential part of ripening pears is keeping them in cold storage for about a month, depending on the variety. Determining ripeness in apples, which don’t need cold storage, is much easier than for pears, he said. Color is a useful indication. Apples may be yellow, red, green or combinations of these colors at harvest. When the green has almost completely given way to yellow, a yellow variety is mature. With red blush or striped apples, the area where there is no red color usually changes from green to yellowish. Ripe apples are easily separated from the tree, but don’t pull the apple down to pick it. Rather, twist it upward with a rotating motion. Another sign is when a few sound apples drop to the ground, which means the apples on the tree are nearly mature.